Appraisers are analysts, problem solvers, and decision makers who need to make a professional and informed opinion of the value of a property as well be able to communicate their decision-making process. One of the most important aspects of an appraisal is the integrity of the data and decision-making used. Appraisals must explain clearly why adjustments are being made and clearly state the reasoning for how the adjustments are being made. Appraisers must explain the reasoning behind that specific dollar value; what makes an adjustment worth a specific amount in that market? Simply stating that an appraiser is experienced and therefore knows how much things would sell for is not an accepted justification for adjustments in sale price. Every appraiser has their own unique perspective and bias, and it is the responsibility of that appraiser to create as objective and informed an opinion as possible. A single-family home with 1 bathroom in a suburb is being appraised, and a sale comparable has 1.5 bathrooms. The appraiser believes buyers in this market recognize the value of an additional half-bathroom. An adjustment will need to be made, but for how much? The appraiser might use cost analysis, or the estimated cost to install a new half bathroom in the house, by using a cost estimating service such as Marshall and Swift, to determine the value of the half-bath. However, the seasoned appraiser recognizes that cost does not always equal value, especially when valuing an older home. Depreciation of the improvement should also be considered. Using Marshall & Swift, the above reflects the cost estimates for a full and half bath. 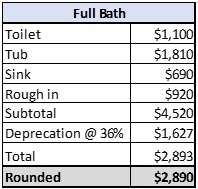 The economic life of a bathroom is 25 years and assuming a constant rate of change of 4.0% per year would result in 16 years of effective age multiplied by the annual depreciation would equate to a remaining economic life. (16 years X 4.0%=64%) Total economic life less remaining equals deprecation. 100%-64%=36%. Further this example assumes a straight-line depreciation. According to Marshall & Swift cost estimates, the cost difference for the installation of an additional half bath is determined as $1,450. The appraiser applied a deprecation rate of 36% for 16 years and determined the adjustment to be $1,440 for the additional half bath.” The adjustment for a half-bath difference comes to $1,450. Another way an appraiser can justify the value of the half-bath is with a paired sales analysis. 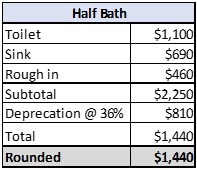 In this method, the appraiser finds two completed sales, similar, except for the number of bathrooms – the difference between the two sales prices being the value of the half bath. The paired sales analysis can be used to extract any number of elements of comparison such as gross living area, a finished basement, additional bedrooms, site characteristics, patios and garages. Trend Analysis: identifying and measuring trends when sales data on highly comparable properties is limited, but a broad database on less similar properties is available. While an appraiser’s judgement is important in the valuation process, market data should be applied using mathematical approaches like those above to derive adjustments. Appraisal reports should clearly show both the “why” and “how” of the adjustments made.